On this Franz Josef Glacier helicopter tour and hike, you’ll land atop the glacier and explore ice caves and pinnacles with a small group. Soar above New Zealand’s Southern Alps during a scenic flight, then grab your crampons and make your way through dramatic ice formations during a moderately difficult 3-hour hike. After your return flight, rejuvenate with a complimentary blissful soak at Glacier Hot Pools. Numbers are limited to 11 to ensure personalized attention from your expert guide. Travel longer and further than most glacier hikes with three hours on the ice. Meet your guide at the centrally located tour base in Franz Josef at one of several morning departure times available. 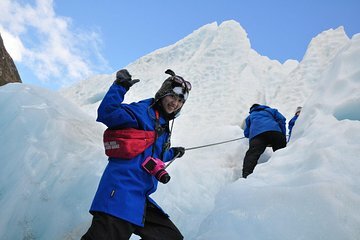 You’re given a safety orientation and provided with protective gear including Gore-tex jacket, trousers, woolen hat, gloves and leather boots with crampons in preparation for your Franz Joseph Glacier tour. Then hop into the helicopter for stunning aerial views over New Zealand's scenic Southern Alps and surrounding area — a magnificent sight to behold. After a brief flight, you’ll experience a gentle yet thrilling landing atop the mighty Franz Josef Glacier. Ice axe in hand, set off on foot with your guide past ice formations that protrude alongside ice caves, pinnacles and seracs. Explore the dramatic landscape as you hike for 3 hours past mazes of ice and deep blue crevasses along the 7.5-mile-long (12-km) glacier. With insight from your guide, you’ll understand the various geological forces at play in this otherworldly environment. At the conclusion of your glacier hike, return to Franz Josef by helicopter and unwind with a rejuvenating soak at the Glacier Hot Pools, situated in a rainforest haven at the edge of town. Relax your muscles in the soothing hot pools, which are fed by pure glacier water — an ideal way to complete your half-day adventure. Incredible experience, very well organized in all senses. Equipment was in perfect conditions, had an excellent guide, safety was ensured at all times. Tolle Besatzung, super Flug! Wir haben uns jederzeit sicher gefühlt. Empfehlenswert! Der Ablauf war Problemlos und sehr professionell. Es war eine atemberaubende Erfahrung mit einem Helikopter auf einem Gletscher zu landen. Wir hatten genug Zeit um tolle Fotos zu schießen und uns von unserem tollen Piloten die Landschaft erklären zu lassen. Sehr zu empfehlen!!! Wir würden jederzeit wieder fliegen. Hands down the best tour I have been on! The glacier was amazing! Our guide, Justin did a great job keeping us all entertained and telling us about the glacier! The equipment they provide was clean and in excellent condition. Wow!! What an adventure. This was a great excursion. The helicopter ride was about 10-15 minutes and then 3 hours on the ice. Don't be afraid of walking on ice and through crevasses. The guide was helpful and started slowly so everyone became comfortable walking with crampons. Highly recommend this excursion. It's not my first glacier and I can say it was really amazing! The track on the glacier was really interesting, including walking inside the glacier and watching a lot of stunning views. Strongly recommended. Really fun. Worth it. What's not amazing about taking a helicopter up on a glacier and walking around. The pools, which are included, were busy but you have 24h to use the voucher. I would say try to get on the glacier asap during your stay in Franz Josef. I was in New Zealand for 9 days and this was my favorite part of the trip. The guides were great and the hike really made you appreciate the enormity of the glacier. 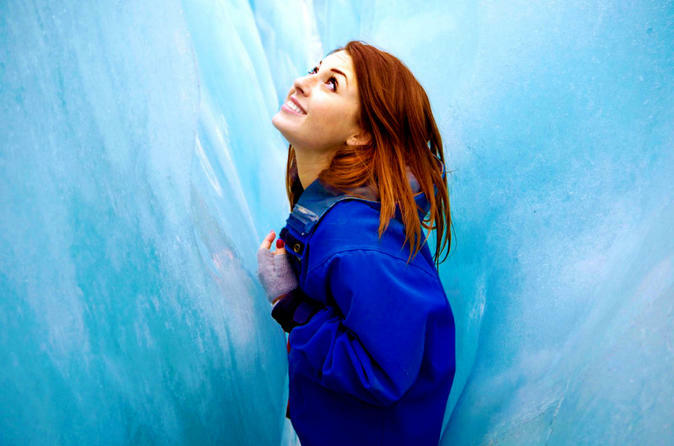 We trekked through some crevices in the ice that allowed you to see the inside of the glacier. All in all it was definitely worth the money. Não foi possível fazer o passeio por causa do mal tempo. Não posso avaliar, não fiz o passeio. tenho de pedir o ressarcimento do valor pago a VIATOR.